Hi, my darlings!! I have a super exciting review for you all today! As some of you who follow me on Facebook know, I've recently been accepted as a blogger for Maria of NailNation 3000! SQUEE!! 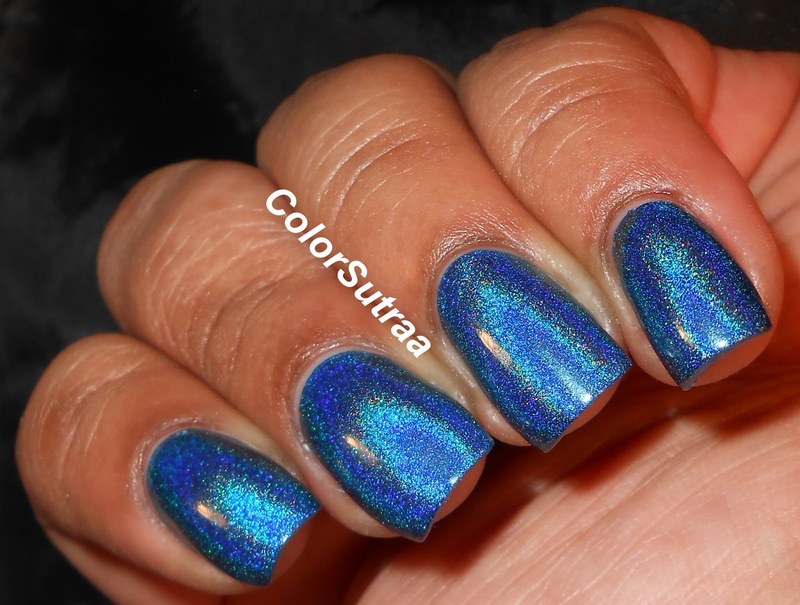 I've loved Maria's polishes, especially her gorgeous holos for a LONG time--in fact, hers were some of the very first indies I splurged on even before ColorSutraa was born! So you can only imagine my excitement at being able to review for her! Although officially my blog month for NailNation is not til May, Maria was kind enough to include a very special exclusive trio with a recent purchase I made. Are you ready for this? Recently, Maria announced that, as part of The Artisan Group, she would be providing a gift of 3 black box polishes to celebrities attending the MTV Movie Awards...and guess who gets to swatch them for you?! ME! YAY!! On to swatches! 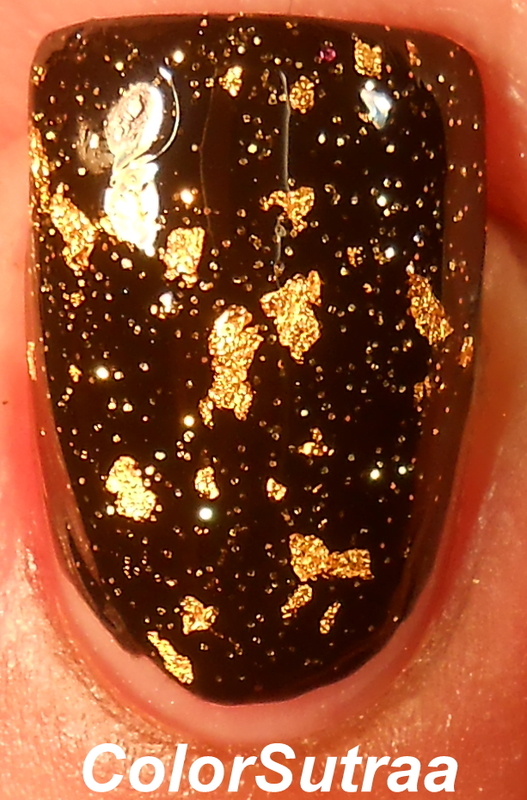 First up, I have for you Shine On Me--a clear topcoat full of 24K gold leaf flakies! The application and formula of this was fabulous--I barely had to swish the brush in the bottle before all these precious flakies came right up! The swatches below show 2 thin coats of Shine On Me over 2 coats of Sinful Colors Black on Black, with 1 thin coat of G&G's HK Girl to finish the look. Now I've never been overly attracted to the gold leaf topcoats but I have to say, I was missing out! I absolutely ADORE how this particular mani turned out! First up, I have for you Boardwalk Empire--a stunning deep blue polish with a strong linear holographic finish. Again, stellar application and formula--the swatches below are just TWO coats by itself! Such a rich, vibrant shade of blue! LOVE! So there you have it, my darlings!! The stunning celebrity gift trio for the MTV Movie Awards from our very own Maria of NailNation 3000! If you need to add these beauties to your stash, and I do suggest you do, you can find them HERE for the price of $60.00 for all three full-size, 15 mL (0.5 oz) bottles. Be sure to follow NailNation's FACEBOOK PAGE, TWITTER and INSTAGRAM for all the latest news and updates! Will you be adding this trio to YOUR stash? As always, I'd love to hear from you in the comments section below! =) I would love to know what you end up getting! A hard thing about being famous is that people are always nice to you. And to really enjoy being famous, you need to have a screw loose.